Arms: Or, three dexter hands appaumé Sable, ensigned with flames of the field within a bordure gules. Crest: On a helmet to the dexter, lambrequined Or and Sable a Sara (Ibis leucocephalus – Ciconiidæ) proper. Supporters: Two bears, ensigned on the shoulder with flames proper. Arms: Murray, an eagle displayed Or, on a canton of the second a lion statant of the first. Crest: On a helmet to the dexter, lambrequined Marry and Or, a sambuk Argent. 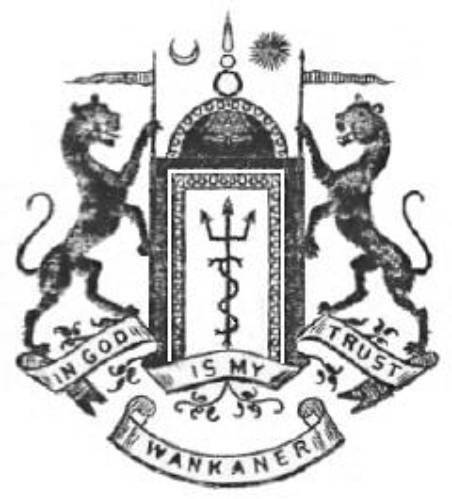 Motto: Manusya Yatna Isvara Krpá (Human Effort, God’s Grace). Arms: Or, a demi man affronté in flames holding a sword in dexter and bow in sinister hand, all proper, within a bordure Sable, charged with eight quatrefoils of the field. 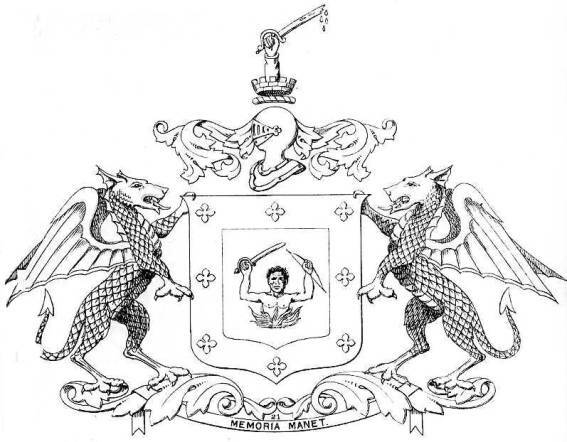 Crest: On a helemt to the dexter lambrequined Or and Sable, rising out of a mural crown Sable, a dexter arm vested Or, holding in bend sinister a sword broken and imbued proper. Arms: Or, a demi man affronté in flames holding a sword in dexter, a bow in sinister hand all proper, within a bordure compony Sable and Argent. Crest: On a helmet to the dexter lambrequined Or and Sable, rising out of a mural crown Sable a dexter arm vested Or holding in bend sinister a sword broken and imbrued proper. * The man in flames is without any doubt a Hindu-god which, however, usually has a sword (khadga) and a shield (khetaka) in his hands. 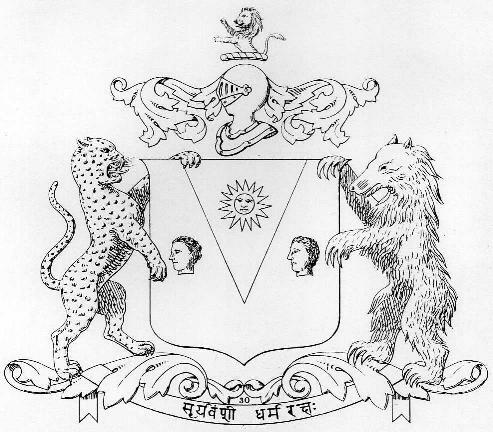 The motto was later translated in Hindi: Smarane Vartate. Arms: Argent, on a pile Gules between two hands couped Sable a sun in splendour. Crest: On a helmet tot the dexter, lambrequined Argent and Purpure, a demi lion rampant Gules. Supporters: A panther on the dexter and a bear on the sinister. Motto: Suryavamso Dharmaraksah (The Race of the Sun is the Protector of Heavenly Law). Arms: Murray, three canopied niches Or. Crest: On a helmet to the dexter, lambrequined Murray and Or, a hand clenched proper, vested Or. Arms: Murray, three canopied niches Or, the field damasqued. Crest: A five-pointed crown and a canopied niche surrounded by four axes. 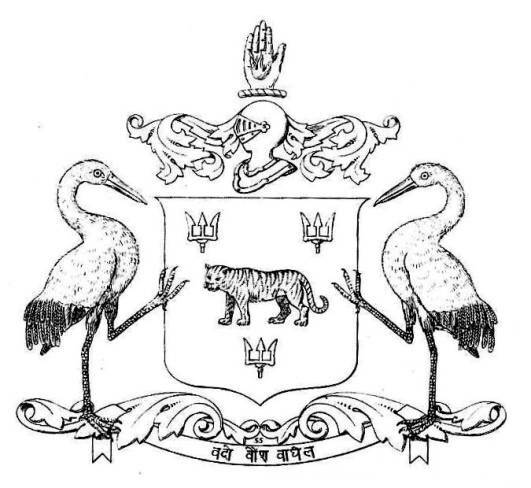 Motto: 1 Anatha Vajrapanjaro Mama Bahuh (My Arm Protects the Defenceless) in devanagiri. 2. 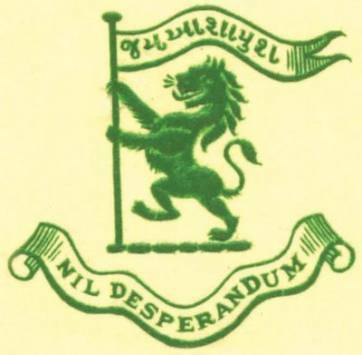 Sri-Sakti-Prasadana Jayatu Sri-Rajah Sukhino Bhavatu Dhararyah (The Noble King be the Conqueror by the Favour of Sri Sakti, the Noble Dara be Happy) in Sanskrit and in gujarati script. Compartment: A platform with three steps, before the lower step a holy cow couchant. The achievement is embellished with fructed branches. 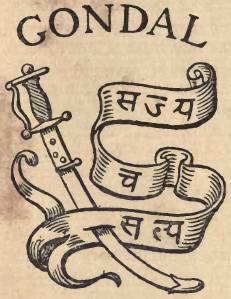 Arms: A belt and sword with the word “Gondal” at the top. Motto: Sajyam Cha Satyam (Ready and True). Arms: Barry of six Gules and Argent, on a pale raguly Vert, a tower of the second, and a canton paly of five Tenné, Argent, Gules, Or and Vert. Crest: On a helmet tot the dexter, lambrequined Gules and Argent, a falcon rising proper. Motto: Ama Idario Gadha Jitya (We Conquered the Fortress of Idar). 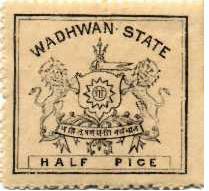 The state was consolidated in 1549, by Sri Maharao Khengarji, the head of the Jadejaclan. This clan had originally migrated from Sindh. The capital of the State was established at Bhuj. Arms: Quarterly: 1. The field of an off-white color, a trident per pale and a sword and an axe in saltire proper; 2. A sambuk on waves of the sea, all proper; 3. A holy cow in a landscape, all proper; 4. A killed tiger (depicted is a lion) in a landscape with a red sky, all proper. Over all a palmtree proper. 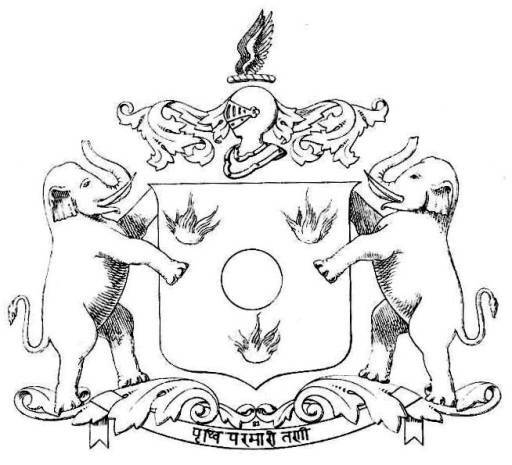 Crest: On an iron helmet affronté, lambrequined Vert, the crown of Kachchh surmounted by a crescent Argent. Supporters: Two horsemen, the sinister carrying a pennon Tenné, charged with a crescent and a sun in splendour (the “Jari Patha” flag), all proper. Motto: COURAGE AND CONFIDENCE in black lettering on a yellow ribbon. Badges: a. In dexter chief of the achievement: a castle ensigned BHUJ. b. In sinister chief of the achievement: An elephant passant proper, his saddlecloth and headgear Gules, fringed Or. On his back two men (sowaris), the hindmost carrying the “Mahi Muratab” or Goldfishbanner. Arms: Gules, over a sword and axe in saltire a banner Or, on a chief Azure an eastern galley (i.e. a sambuk) Argent. 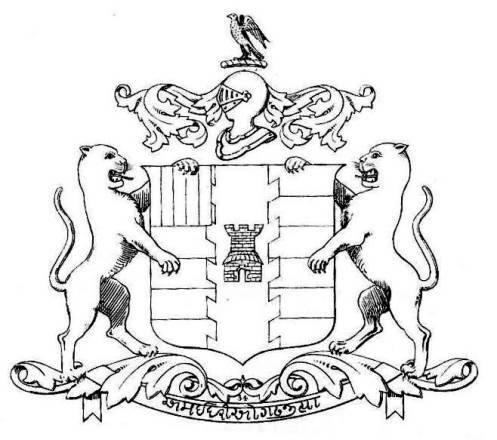 Crest: On a helmet affronté, lambrequined Gules and Or, a castle ensigned BHUJ. Supporters: Horsemen mounted proper, the dexter armed with a sword, the sinister with a lance. 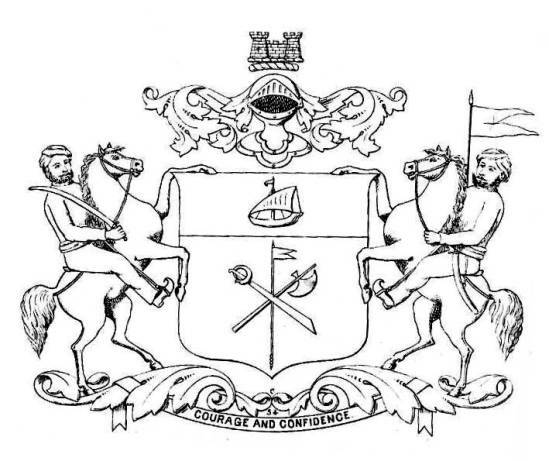 A more recent drawing of the achievement however shows the version of 1876. Limbdi was a princely state during and before the British empire, ruled by the Jhala Rajput dynasty, who also ruled neighboring princely states of Limbdi, Lakhtar, Sayla, Chuda, and Wankaner. After India’s independence from British colonial rule in 1947, Limbdi was integrated into the nation with other princely states. 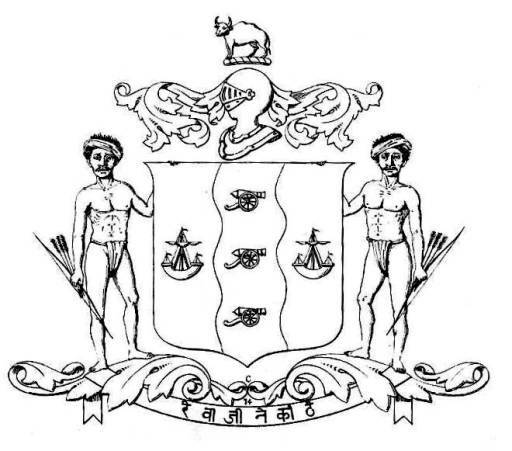 The arms of Limbdi show the emblem of Wankaner within a bordure. Its crest is an open hand and its supporters are a tiger and a lion. Arms: Gules, a tiger passant proper between three tridents Or. Crest: On a helmet to the dexter, lambrequined Gules and Or, a dexter hand appaumé ensigned with a flame proper. Supporters: Two saras (Ibis leococephalus – Ciconiidæ) proper. Motto: Vado Vaumsa Vaghel (The Great Race of Baghel). Nawanagar was one of the two largest of the Kathiawar States in Western India. It covers an area of four thousand square miles. The Maharaja Jam Sahib of Nawanagar maintains as his State Forces a regiment of Lancers consisting of two squadrons and a company of Infantry. Both of these units are composed almost entirely of Rajputs, to which race he himself belongs. Arms: Parted per fess dancetty Gules and Argent, three fish naiant in chief and a galley in base counterchanged. Crest: On a helmet to the dexter, lambrequined Gules and Argent, an antelope’s head erased proper, ensigned with a crescent. Supporters: Two antelopes gutty d’eau. Motto: Sri Jamo Jayati (The Glorious Jam Conquers). Crest: A lion rampant holding a banner and the motto NIL DESPERANDUM. L.: SHRI HAZUR – NAWANAGAR STATE. Arms: Tenné, three eastern galleys (i.e. sambuks) Argent, two and one, and an escutcheon Argent Hanuman proper. Crest: On a helmet to the dexter, lambrequined Tenné and Argent, a bull couchant proper. Arms: Hanuman proper, in base two swords in saltire, surrounded by the legend: H.H. THE MAHARAJA RANA SAHEB. 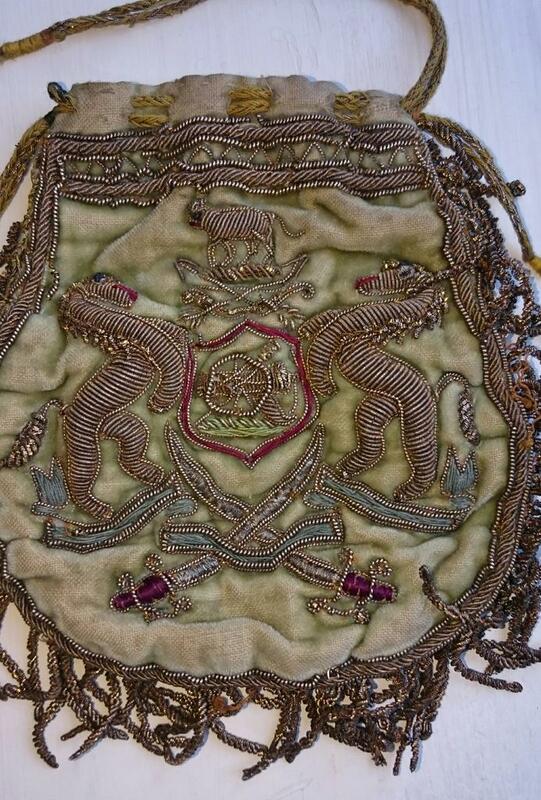 Crest: On a helmet affronté, lambrequined (Tenné and Argent?) a bull couchant proper. 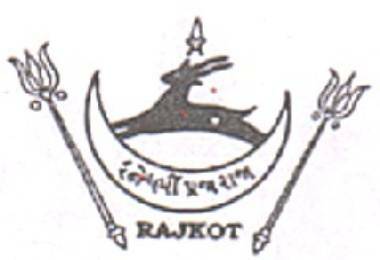 In the time of Dharmendra Singh (1930-1947) the emblem of Rajkot State was a crescent between two tridents. In chief a running deer. Arms: Azure, on a pale wavy betwen two galleys Argent, three cannon Gules, pointed to the sinister. Crest: On a helmet to the dexter, lambrequined Azure and Argent, a bull statant. Supporters: Two Bhils armed with bow and arrow. 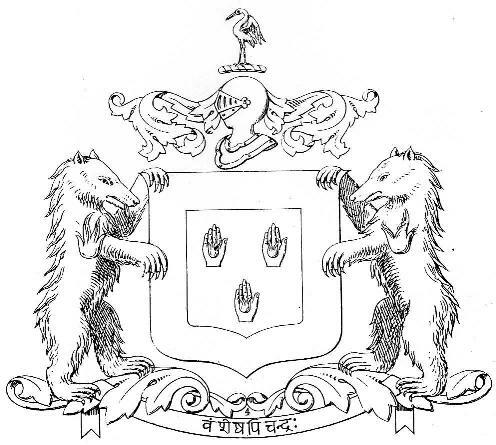 A coat of arms was granted to Rana Pratabsinhji (1873-1896) at the Durbar in Delhi in 1877. Arms: Or, a globe Sable between three flames proper. Crest: On a helmet to the dexter lambrequined Or and Sable, two wings endorsed Or. 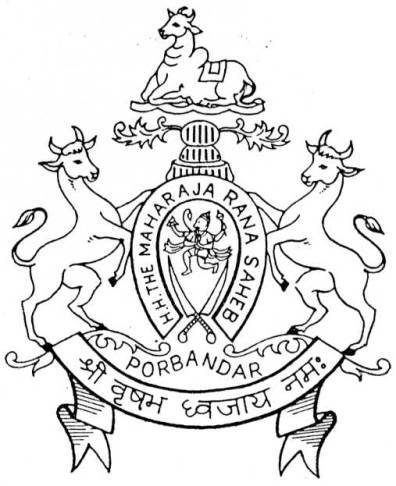 THE RULING PRINCES OF BARODA BORE THE TITLE OF “GAEKWAD” WHICH means “The Rescuer of the Cow”. This refers to an incident in Poona where Nandaji Rao rescued a (holy) cow from the claws of a tiger. 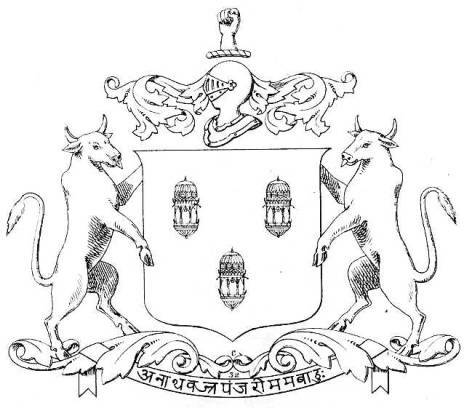 The title “Shamsher Bahadur” has been gained by a son of Nandaji Rao who distinguished himself in the battles between the Maratha’s and the Nizam of Hyderabad. 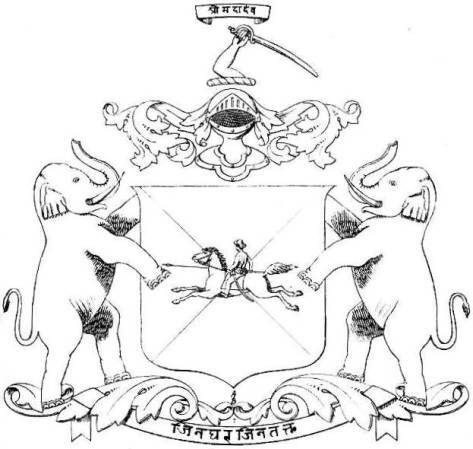 After the collapse of Maratha power the Gaekwad remained the only representative of their former status and Baroda was reputed for its enlightened administration. 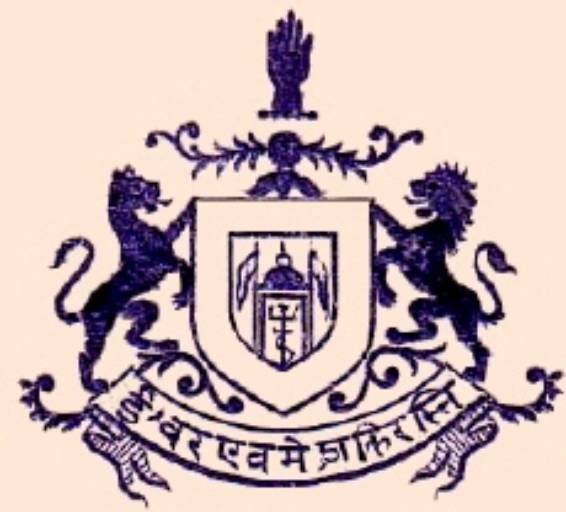 In 1937 Rewa Kantha, Surat, Kaira, Nasik en Thana joined Baroda and founded the Gujarat States Agency with Baroda as its capital. In July 1947 the states joined India and became a part of the State of Bombay. 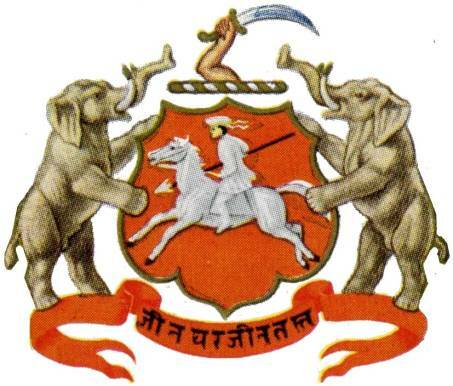 With the splitting up of that state into Gujarat and Maharashtra in 1960 Baroda was incorporated into Gujarat. 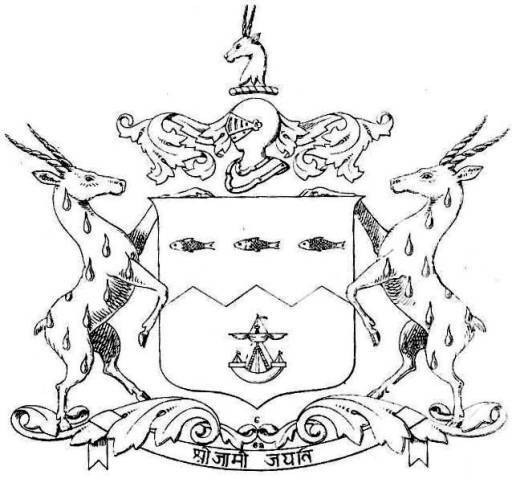 Arms: Gules, the words GUICAWAR + SIRKAR + (Government of the Gaekwar) per bordure Argent and the words SENA KHAS KHEL SHUM BAHADUR (The Valiant, The Sword of the Cavalry, The Leader) also Argent. 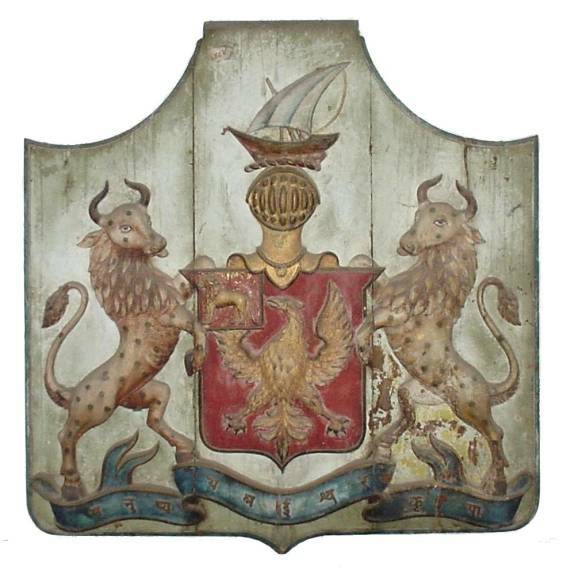 Crest: Two indian maces in saltire, in chief a sword per fess and in base a golden indian shield, all proper. Garland: Flowering branches encircling the shield and in base two other branches in saltire. Supporters: Dexter a tiger and sinister a horse saddled, both suppor­ting a banner consisting of a double triangle Gules charged with two swords Or. Mantle: A pear-shaped screen Gules, strewn with crosslets and circlets Or, crowned with a royal crown. Arms: Parted in saltire Argent and Gules, a horseman charging proper. Crest: On a helmet guardant, lambrequined Gules and Argent, a naked arm holding a sword in bend sinister. 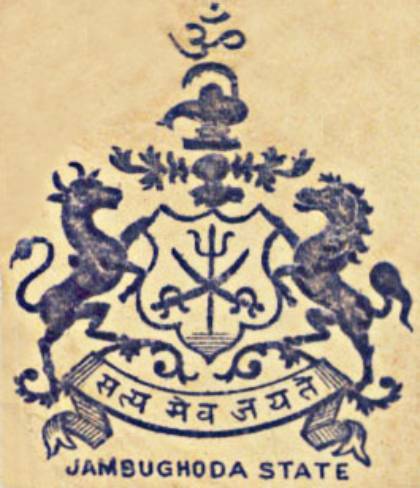 Motto: In base: JIN GHAR JIN TAKHT (The Saddle is my House, my Home and my Throne); in chief: SRI MAHADEVA (Great Lord) both in devenagi­ri script. 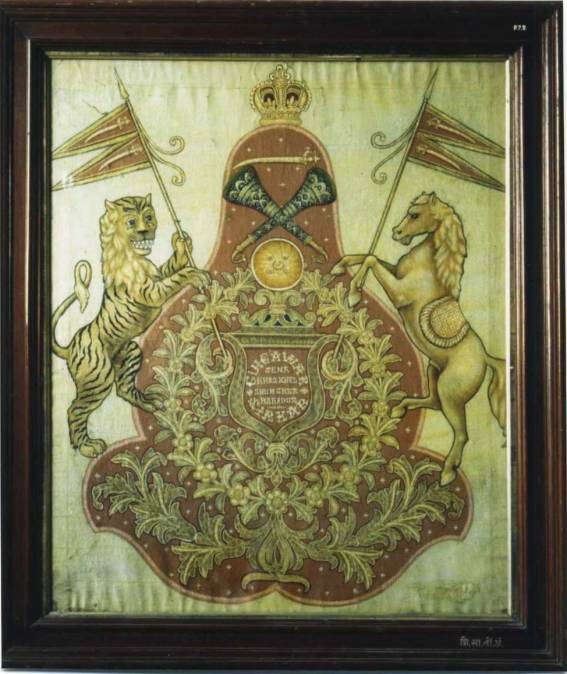 On the banner of Baroda, preserved in the State Museum at Baroda, the shield is parted per saltire Argent and Purpure, the shade of purpure tending to violet. Arms: Tenné, a horseman charging Argent. Crest: On a wreath Argent and Or, an arm embowed armed with a sword proper. Arms: (Tenne) a horseman charging (Argent). Crest: A sword per fess, hilt on the sinister proper. 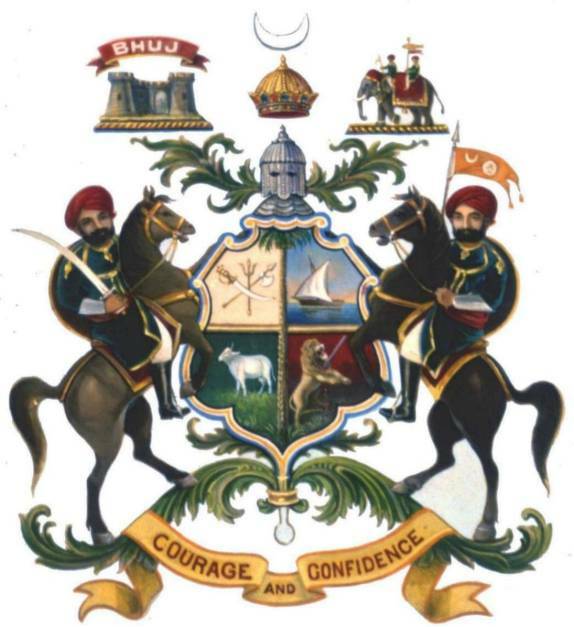 Crown: The crown of Baroda. Supporters: Two elephants, in their trunks two indian maces in salti­re. 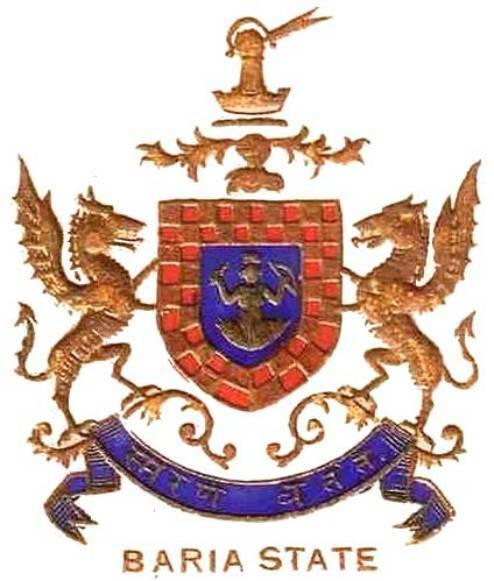 Motto: In chief: SRI MAHADUR; in base: JIN GHAR, JIN TAKHT. Arms: A sun radiant charged with the word “OM” (amen). Crest: A trident with a pennon. Supporters: Two lions rampant guardant. The flag of Wadhwan shows the trident from the crest. Motto: IN GOD IS MY TRUST. The flag of Wankaner shows the achievement of Wankaner in yellow on a red cloth.